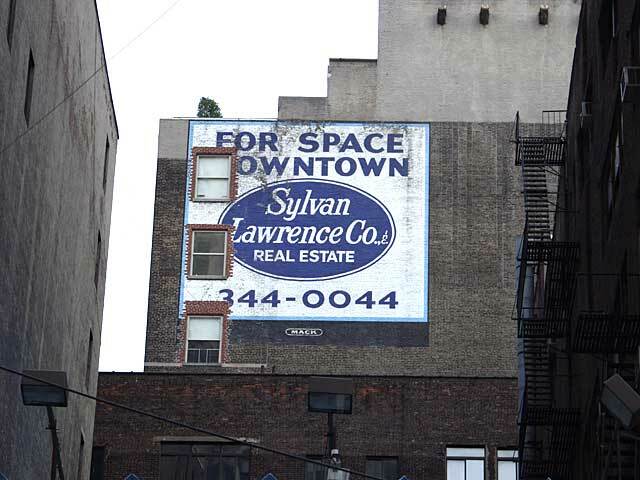 Occupying an unusual landlocked midblock space, this sign is visible from the west along Dey St. through a crack in the line of buildings on Broadway to the east. Bob Middleton, who painted the sign, writes "the windows are new and it's in very good shape for a sign I painted in, appox. 1978. I think Sylvan Lawrence had in mind that it showed to the World Trade buildings and maybe could pick up some tenants who wanted to move out." Mack Sign Co. painted at least 20 or more signs for Sylvan Lawrence.